Ian (Pringle) and I put in for weekend leave on routine Valencia to Tel Aviv, and should have gone today if it hadn’t been for the damn trouble. 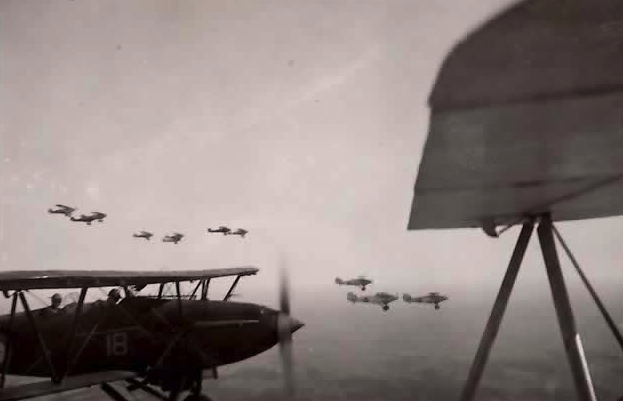 One of AVM Smart's 'Demonstration Flights' to frighten the Iraqis, April 1941 - Audaxes flying in formation from Habbaniya. We do a formation flight the other day of four squadrons – Harts with Oxfords circling overhead and the three Gladiators down below. I went in Dan Cremin’s front seat and we went over Falluja and Ramadi. Ling showed me the air photographs of Falluja showing an anti-aircraft gun there. Heard last night that 30 Indian Battalions arrived the other day in Basra, being “Niblick” force. Alan Haig very drunk in the Club on neat whisky. The ’30 Indian battalions’ have now turned into a few Iraqi army troops.